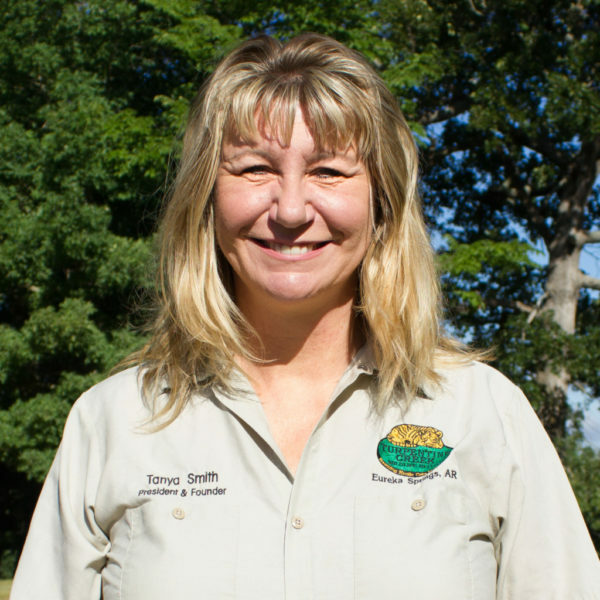 Tanya Smith serves as the President/ Co- Founder of Turpentine Creek Wildlife Refuge (TCWR). The non-profit organization was formed in 1992 when Tanya and her parents purchased 459 acres 7-miles south of Eureka Springs, Arkansas with the goal of saving and providing lifetime homes for unwanted and neglected exotic cats. TCWR started an innovative college graduate intern program in 1996 and has trained more than 500 biologists and zoologists now employed at zoos, sanctuaries and veterinary clinics around the world. Tanya currently serves on other Board of Director’s. Turpentine Creek Foundation, Inc., Arvest Community Bank Board, Arkansas Hospitality Foundation Board, Northwest Arkansas Tourism Association (NATA), Big Cat Sanctuary Alliance. Tanya is a Founding Member of the Court of Cavilers and an active member on the Rescue Committee of the Big Cat Sanctuary Alliance (BCSA), a member of Eureka Springs, Bentonville/ Bella Vista, Rogers/ Lowell, Springdale, Fayetteville, Harrison and Branson Chamber of Commerce’s. Tanya’s family has been caring for Big Cats since 1978. She is married to Scott Smith, who works for the refuge as Vice President and together have raised five children and has 7 grandchildren.